Set in a secluded cove on 22 acres of land only three miles from Castries, St James's Morgan Bay is a vibrant all-inclusive resort for families and couples. Its great location means that guests can explore the island of St Lucia whilst enjoying all the facilities of a beachfront hotel. With 335 rooms and a wide range of accommodation options, guests can choose views of the ocean, pool or gardens with 100 of the rooms nestling on the hillside. The resort aims to be flexible to meet its guests’ requirement in terms of bed sizes, rollaway beds and cots. St James’s Club Morgan Bay has a choice of six restaurants serving breakfast, lunch and dinner and offering a range of cuisine. From breakfast in The Palms Restaurant to afternoon tea at the beachfront Bambou Restaurant and a fresh seafood dinner at Morgan’s Pier restaurant - the variety and quality of dining offered is a treat for every hungry guest! There are also six bars ranging from a lunchtime cocktail served poolside through to the Sunset Bar and Lounge for a social and lively drink to the sounds of a local band. St James’s Club Morgan Bay provides a range of evening entertainment from live music to the weekly manager’s cocktail party. The resort has four swimming pools including one for children and one for adults only. Activities include both motorised sports such as banana boat rides, wakeboarding and water skiing through to non motorised watersports such as snorkelling, Hobie cat sailing, paddle boarding and kayaking. On dry land guests will find tennis courts, volleyball, a fully equipped fitness centre and a range of fitness classes such as Thai Chi and Caribbean Dance! Guests can enjoy a comprehensive range of treatments offered by the Tranquility Body & Soul Spa for a perfect pampering experience. The Kids Club at St James’s Club Morgan Bay caters for children aged from 2 years old and has been created to offer children a stimulating fun, learning experience while offering parents’ peace of mind to enjoy some ‘grown-up time’. For younger children the resort also has a nursery for children up to 23 months old while teenagers can use the Teen Centre. 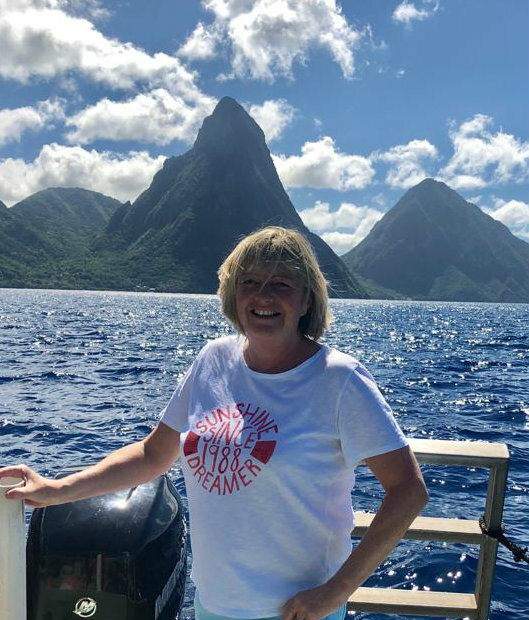 For more information about St James's Club Morgan Bay or alternative resorts, take a look at Su's St Lucia Trip Diary. This resort is a great all-rounder as it really does have something for everyone, from small children to active grandparents. The all-inclusive plan is comprehensive as motorised watersports are included, along with a great selection of activities both on land and sea on offer. If you are looking for a value-for-money break it really is hard to beat! I was impressed with the choice of restaurants available and particularly liked the Choc Bay Cafe which was open all day for coffee and a pastry - a nice addition! The excellent choice of rooms on offer means parties of all sizes are well catered for, with family suites offering plenty of space for groups of up to 6 to share comfortably. It's a large resort with plenty going on, and as there are separate areas for families, children and adults-only, everyone can find their own space to enjoy some sun! Children: Children are very well catered for at St James’s Club Morgan Bay making it an ideal Caribbean family resort. Distance from the airport: Approximately one hour and 10 minutes' drive from Hewanorra International Airport. To get there in style, helicopter transfers are also available between Hewanorra International Airport and George F.L Charles Airport, taking approximately 10 minutes plus a drive of under 10 minutes between the airport and the resort. Helicopter transfers cost around £150 each way - ask our Caribbean specialists for more information. Location: St James's Club Morgan Bay is centrally located with Castries and Rodney Bay both nearby. During your stay you can easily explore the local attractions, restaurants and markets. Facilities: Four swimming pools including one for children and one for adults only, land sports including tennis, a fully equipped fitness centre and a range of fitness classes such as aerobics and body pump. Both motorised and non motorised watersports including banana boating, sailing, snorkelling, Hobie cat dinghy sailing and paddle boarding. Nightly entertainment features live local bands as well as the manager’s weekly cocktail party. Additional tours and excursions such as catamaran sailing tours, diving, zip lining and trips to the Sulphur Springs are all available for a local charge from the concierge. The hotel has a full spa offering a diverse range of treatments (to be paid for locally) and there is an 18 hole golf course nearby. Wi-Fi: Complimentary Wi-Fi is available in the lobby and Sunset lounge area. Taxis: The guest services desk will be happy to organise taxis. Laundry: Overnight laundry and ironing services available at an additional charge. Credit Cards: American Express, Visa, MasterCard are accepted at the resort. Guests must provide a valid major credit card at check-in- to cover any incidentals such as telephone calls, room service etc. Meal Arrangements: All-inclusive includes breakfast, lunch, dinner, snacks, soft and alcoholic drinks. However, there is a $25 supplement for Lobster and Steak dishes. Restaurants: Six restaurants: The Palms Restaurant set in the tropical gardens serving breakfast, lunch and dinner as either buffet or a la carte; Bambou Restaurant is a modern beachfront dining option serving breakfast, lunch and dinner; Morgan’s Pier is open for lunch and dinner and offers fresh grills and local seafood; The Plum Tree Bar & Grill offers great day time dining for the whole family, located in the family pool area. Tree Top’s restaurant serves a fantastic range of pizza and pasta dishes and is set in the hillside offering fantastic views and finally, Le Jardin is St James’s Club Morgan Bay’s exclusive, evening dining option - a supplement of US$35 per person is payaple,. Check In/Out: Check in at 3pm and guests are kindly asked to check out at 12 noon. Accommodation: There are 335 rooms at St James's Club Morgan Bay and these are divided into 8 different categories. As standard each room features either a king sized bed or two double beds - additional guests and children can be catered for in cots or rollaway beds (this applies to certain room categories only). In all rooms guests will find air conditioning, a flat screen TV, beach towels, a safe and a tea and coffee maker. Each room has its own balcony or patio. All rooms and suites are non-smoking. Garden View Room: These rooms feature a king size bed, en suite bathroom and a terrace or balcony with views over the gardens. Maximum occupancy: 3 persons. Ocean View: These rooms feature a king size bed, en suite bathroom and a terrace or balcony with sea views. Maximum occupancy: 2 adults. Premium Double Room: These larger rooms are furnished with two double beds, an en suite bathroom and balcony. Maximum occupancy: 4 persons (including up to 3 adults). Beach Front: Located closest to the beach, these rooms offer a king size bed, en suite bathroom and a balcony or terrace with ocean views. Maximum occupancy: 3 persons. Deluxe Ocean View: Set on the resort’s hillside, these spacious rooms offer panoramic views of the resort, the sea and beyond to the lights of Castries. Maximum occupancy: 2 adults. One Bedroom Ocean View Suite: These suites are located in the hillside of the resort and offer beautiful views of the Caribbean Sea. These suites have one bedroom with a king size bed, a living area with a sofa bed and a spacious balcony stretching the length of the suite. Maximum occupancy: 4 persons (including up to 3 adults). One Bedroom Garden Spa Suite: These suites are set on the hillside and offer superb views from the huge balcony. Inside, there is a spacious bedroom, a living room and a bathroom featuring a large Roman bathtub. As a guest of the One Bedroom Spa Suite you will enjoy a daily complimentary spa treatment (up to 5 per week). Maximum occupancy: 2 adults. Family Suites Garden View: These family suites comprise of two garden views rooms which are interconnected – featuring two bedrooms one with a king size bed and the other has two double beds in the other. Maximum occupancy: 6 persons (including up to 5 adults). Two Bedroom Suite: These newly-refurbished suites are set on the hillside and comprise a spacious king-size bedroom with separate living room, connecting to a Deluxe Room with a kingsize bed or two twin beds. Both bedrooms have a full bathroom and private terrace, while the living room has a queen-size sofa bed. Maximum occupancy: 7 persons (including up to 5 adults).